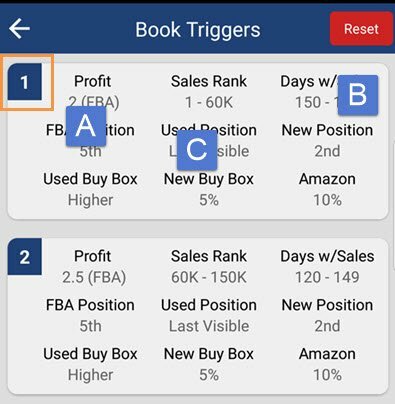 Profit trigger helps sellers decide whether an item is a ‘Buy’ or a ‘Reject’, based on profit amount and other factors such as Sales Count, Ranking, Number of Offers, FBA price, Used price, New price, Amazon price, and Buy box Price. It plays a customized sound and displays a message based on the result. Tap at the trigger number (A) to enable/disable this trigger. 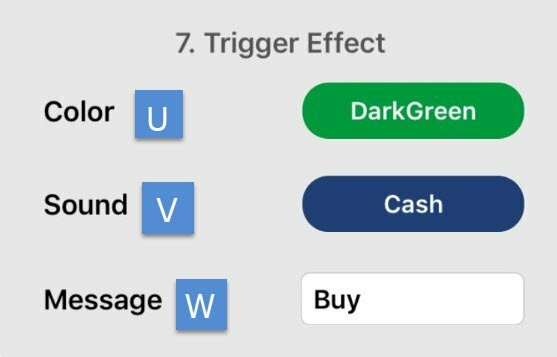 Tap the Reset button (B) to reset all Profit Triggers to the default. Tap trigger summary (C) to edit this trigger. How soon this item will get sold. You can use “Days with Sales” (D) or “Sales Rank” (E) to determine. Days with Sales: Number of days this item has sold at least one copy during that day for the past 6 months. Sales Rank: Amazon proprietary algorithm to indicate when the item was sold last time. 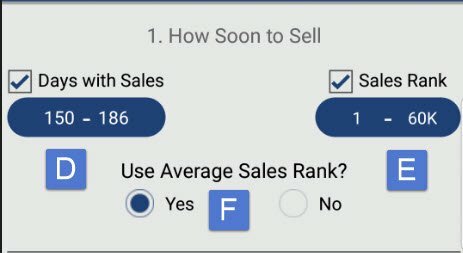 We recommend you enable “Use Average Sales Rank” (F), so you have an idea how quickly this item was sold during the past 6 months. Consider max number of offers or minimum price for this trigger to signal a buy or not. 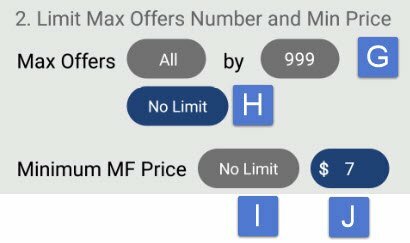 Max Number of Offers: If you want to pass an item with too many sellers, disable “No Limit” (H), set a max offer number for a condition (G). Minimum Price: If you want to pass an item with a very low price, disable “No Limit” (I), set your minimum accepted price(J). Option 1 is the lowest FBA price, Option 2 is the second lowest FBA price, etc. For example, if the book is popular and moves quickly, you don’t necessarily need to be the lowest offer. 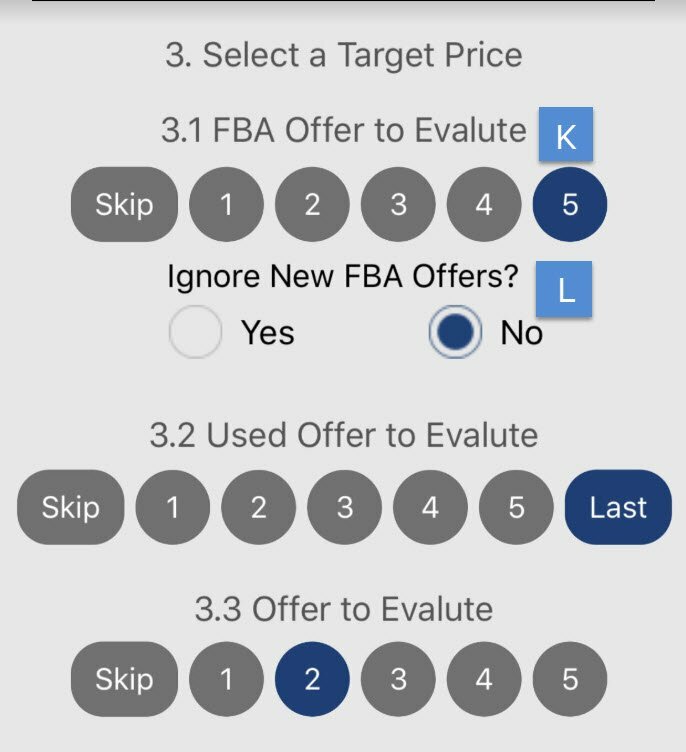 If the trigger finds an FBA offer to evaluate, they won’t look at the Used Offers. If they can’t find one, or if you’re a Merchant Fulfilled Seller, “Used Offer To Evaluate” will help you select a target list price. For “Used Offer To Evaluate”, there are options 1-5, skip, or last (one being the lowest used price). 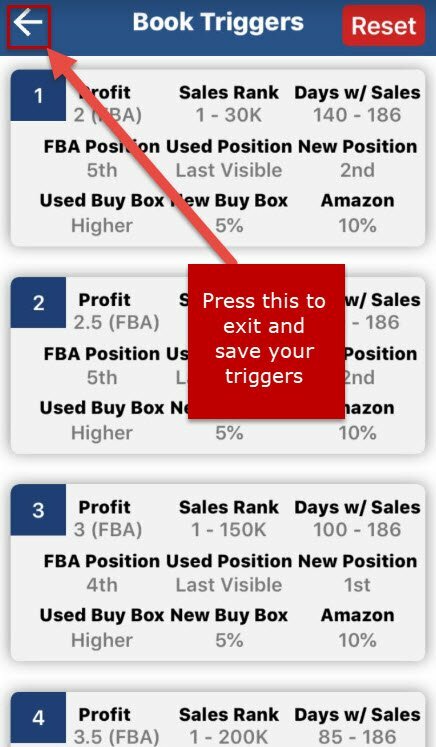 If Used Buy Box price is lower than the current Target Price, then it will lower the Target Price to match the Buy Box price. If Used Buy Box price is higher than the current Target price, then it raise the Target Price to match the Buy Box price. 7. Customize the color, (U) sound, (V) and message (W) you wish to receive for this trigger. Tap the corresponding box to change any one of these. To exit, press the back arrow, your trigger will be automatically saved. 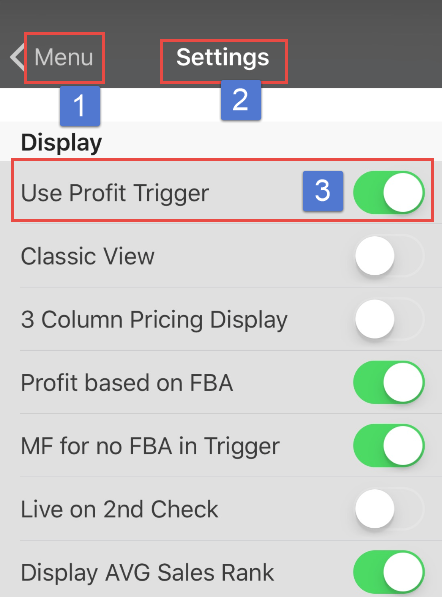 *If you are calculating profit based on FBA but there is no FBA listed, you can have FBAScan check for MF listings instead by making sure “MF for no FBA in Trigger” is selected in Menu —> Settings.